Registration is now open for the 2018 Chichester Triathlon series. The triathlon, sponsored by Natures Way Foods, will take place on the weekend of June 2 and 3. Event hosts Everyone Active are aiming to make it the biggest one yet. Last year, more than 900 participants aged eight to 85 participated in a variety of races across the two days. Now in its 12th year, the Chichester Triathlon has evolved from a single race into a weekend-long festival of activity. Young people aged eight to 16 can take part in either an aquathlon or triathlon on the Saturday before adults get their turn to compete on the Sunday. Those over 16 can get involved in a sprint distance triathlon, consisting of a 400m pool swim, 33km bike ride, and a 5k run. Alternatively they can opt to take part in an Olympic-distance race featuring a 600m pool swim, a 42km bike ride and a 10k run. Both races can be entered as part of a team or individually. The event will form part of the Everyone Active’s south-east triathlon championship alongside races at its leisure centres in Fareham, Hart and Petersfield. 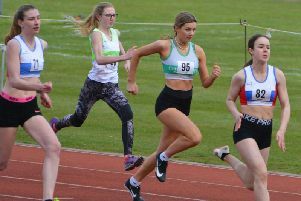 The series has been created to encourage participants of all ages and abilities to participate in multisport events, and caters for first-time competitors through to semi-professional athletes. Stuart Mills, contract manager at Everyone Active, said: “I am delighted that the Chi Tri is returning for its 12th year. It has developed into a huge event in the town’s sporting calendar, and we are delighted to be delivering it again. “Everyone Active’s south-east triathlon championship will give customers the opportunity to experience what’s on offer at our centres across the region. Sarah Baldock of Natures Way Foods added: “NWF has sponsored the Chichester Triathlon series since 2007 and we’ve been delighted to watch more and more people take part every year. Everyone Active is offering support for novice competitors in the run up to the event through specially-designed training plans and triathlon workshops.